Today, our group experienced political tensions in Kenya, religious violence in Nigeria, and the rather more mundane experience of mortality that comes with aging parents. And for me, what would have been just two more headlines were made very real by three of my colleagues who hail from these countries. Come Thursday, my friends Charles and Christopher and Dennis were going back to shepherd flocks in these countries. That realization was a jolt; a reminder that there is a “real world” (of course, the scare quotes are on purpose) to which we will all be returning in a few days, a world whose reality needs to be challenged and overturned by the coming of the really real–the Kingdom of God. It was with those thoughts in mind that I came to see the first half of Andrei Tarkovsky’s film, Andrei Rublev. It’s a very different kind of film from what I’m used to. 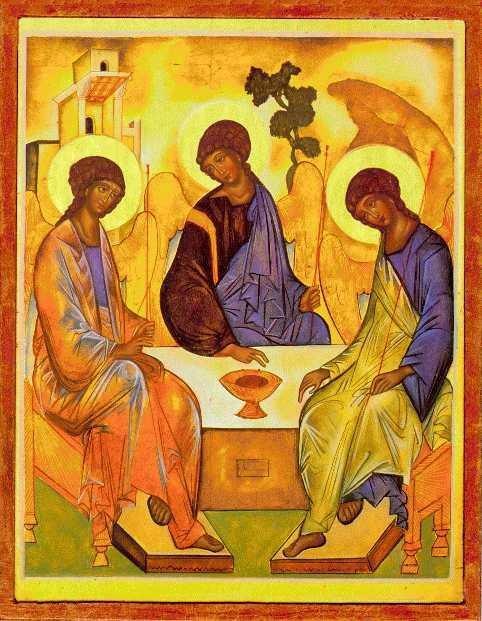 There is, thus far, no discernible narrative; it is more a series of vignettes taken (rather loosely, I’m told) from the life of Andrei Rublev, the great icon painter of 15th century Russia. Here was a man surrounded by the concerns of the “real world,” who nevertheless produced some of the greatest icons in all of Christian history. A man who, in the midst of tartar invasions and mindless violence, stayed true to the vision to which God had called him and did so without withdrawing from the world. Indeed, he left the safe spirituality of the monastery to live out his vocation in public (at least thus far in the movie). As a result, his iconography was a witness to the beauty of God in the world of his time and does so still today. So, as my pilgrimage to Canterbury moves into its final days, I am confronted by the real world to which I will soon be returning. I thank God that I am not going back to Kenya like two of my colleagues, where Somali Islamic extremists are sowing violcence. I am grateful not to be going back to Nigeria with another of my colleagues, where Boko Haram is increasingly targeting Christians with bullets and bombs. I am going to the safety and security of Canada. But even there, I feel very much that I am a stranger, that I don’t quite fit with the culture. Of course, feeling a sense of dis-ease, of lack of fit, with the world is precisely what the Christian is supposed to feel a good bit of the time. That’s what the vocation of the baptised is about. We have been baptised into Christ, and thereby been made citizens of a different country and subjects of a different king. And while we give penultimate allegiance to those powers at once instituted by God and defeated by Christ, our primary loyalty lies elsewhere. And yet, the feeling of disease is not, for me at least, the call of God to the life of solitary prayer (not that I could anyway!). It is the call to live my vocation as a witness to a different way in the world, even as it seems that I understand the logic on which that world functions less and less. Looking forward to the second half of the movie tomorrow night. Today, we met with Archbishop Rowan again–when he saw us in the Cathedral this afternoon, he came over, winked and said, “We’ve got to stop meeting like this.” Sadly, we will. This was our last time with him. Amazing man. I think he should make a Canadian lecture tour once he’s nicely settled in Cambridge. What do you think? Anyway, I’ve been thinking about pilgrimages. For two reasons. First, that’s what this conference is, if not for all of us, certainly for the majority and certainly for me. I wasn’t joking a couple of posts back when I said this was my ad limina. It really was. It was a pilgrimage to the mother church, to the throne of St. Augustine, to cement in my own mind and heart, the vows I took before God, vows taken for the welfare of this global community as one of its priests, vows lived out in a community that gathers for worship at the Church of the Epiphany in Sudbury. Second, the conference has been surrounded by pilgrimages. We watched The Way about Thomas Avery’s pilgrimage on the Camino de Santiago de Compostella; we walked 10km of the ancient Pilgrims’ Way from Chilham to Canterbury; we celebrated the millennial anniversary of the translation of St. Alphage to his current resting place at the north end of the high altar–a translation that was a penitential pilgrimage for King Canut; we met this afternoon with Kurt Cardinal Koch and talked about the ongoing pilgrimage that is the ecumenical dialogue between Anglicans and Roman Catholics. But over the week, my discomfort has become more specific. I don’t like journey because journey can, and often does, leave me in charge. I can journey to Toronto; you can journey to Iqaluit; we may for a time journey together, but in the end, we’re headed to different directions. I can journey alone or I can journey with a group. Journey is all too often all about me on my great voyage of self discovery. Not so the pilgrim. The pilgrim has a definite destination, whether to the gate of heaven that is (or at least was) the Shrine of St. Thomas Beckett at Canterbury Cathedral where the knees of millions of pilgrims have worn a grooves in the marble, or Santiago de Compostella where pilgrims’ hands have worn a pillar at the entry. As a pilgrim, I am going somewhere. And specifically, I’m going to heaven. And on this very specific journey, I am not in charge. I have, like another Pilgrim, entered at the narrow gate. The pilgrim never journeys alone. Medieval pilgrims travelled in groups for the very practical need of safety. But even today, pilgrimage–the real thing–is not a solitary undertaking. It is an even undertaken by a community, and that community is constituted by the common destination. Thomas Avery would never have befriended Joost, Sarah, or Jack from Ireland based on common interests or likeability or anything else. What brought them together was the Camino. I am not alone on my pilgrimage; I am part of a community. I am part of a community constituted by our common Lord and our common destination. Left to my own devices, I may not have chosen this community as my travelling companions. But like I said, I’m not in charge. Third, the language of pilgrimage helps challenge the narcissism that drives so much of the spirtuality of our age. Self-discovery certainly happens on the pilgrimage–you’ve read about a fair bit of mine. But at the end of the day, self-discovery isn’t the point of a pilgrimage. God-discovery is. And God and I have connected. No, no Damascus-road or otherwise charistmatic (small “c”) connections. But a quite, growing sense of confidence that I am where God has called me and, whatever discomforts lie ahead, I will face them with God’s blessing and presence. He who would valiant be ’gainst all disaster, Let him in constancy follow the Master. There’s no discouragement shall make him once relent His first avowed intent to be a pilgrim. Who so beset him round with dismal stories Do but themselves confound—his strength the more is. No foes shall stay his might; though he with giants fight, He will make good his right to be a pilgrim. Since, Lord, Thou dost defend us with Thy Spirit, We know we at the end, shall life inherit. Then fancies flee away! I’ll fear not what men say, I’ll labor night and day to be a pilgrim. This morning, Bishop Josiah led us in an intensive study on the concept of discipline. Hard subject. But, one ordinands and clergy need to talk about since we vow to uphold the doctrine and discipline of Christ as this church (in my case, the Anglican Church of Canada) has received them. And the marks of the church for Reformed Christians include, along with the Word of God truly preached and the Sacraments rightly administered, discipline faithfully applied (as noted and defended within our Anglican family by Nicholas Ridley, one of the Oxford martyrs). Discipline, Josiah observed, was a weak point in our communion, and he spoke movingly of two examples from his own church in Nigeria, one in which discipline was faithfully applied and one where it had failed to take place for a number of years to devastating results. So, how does the faithful application of discipline take place in a time and place where one is (justifiedly) suspicious of claims to authority and power? That was the question that Bishop Josiah’s presentation prompted and left unanswered. I wonder if I can get my bearings from the doctrine of creation in which God’s power is not power over a resistant but lesser, pre-existing stuff, but is more basically, the power to call into being that which has no existence of its own. That is true power, but not “power-over” (i.e., the kind of coercive power that every parent knows about–“because I’m your dad!” power). Or perhaps christologically, where power is not the power to conquer God’s enemies with 10 000 angels, but the power of resurrection. Both of these understandings of power–the one creative, the other subversive and apparently submissive–are interrelated in that neither involves coercion. And yet, both are legitimately powerful–the acts accomplish their intended objectives. God speaks and the world is created. Christ is raised and death is defeated. When I have to engage in those kinds of conversations, even if I do so, as Bishop Josiah reminded us based on Matthew 18, humbly, honestly, prayerfully and with a view to forgiveness, I will be exercising power which will look and feel coercive if not for me then certainly for the person on the receiving end. So, how do I keep in mind the kind of power that is creative rather than coercive, redemptive rather than punitive? How do I exercise discipline faithfully such that, hopefully, it is is experienced by all as creative and redemptive rather than coercive and punitive (if not at the immediate time, at least eventually)? I have no answer to these questions just now. They really are disturbing for me. This one will be with me a while longer. I would be grateful for any advice. Especially from those of you in ministry–do these kinds of questions trouble you? What does the faithful application of discipline look like to you? I know that a couple of you wear episcopal purple–I would be especially grateful for your help! What a day! Nothing quite like spending the day with a Nigerian bishop–Josiah Fearon–to renew one’s love for the mater ecclesiae, Cantuar. He blessed me and I hope the reflections below give a just a little glimpse of his profound wisdom, joy, and enthusiastic love for the Lord. Bishop Josiah was ostensibly here to talk about Islam and Christianity, since he is an expert on Muslim/Christian relations in Nigeria. His remarks on dialogue, however, were not so subtly directed from their original context in interfaith relations to the context of our own church. And I want in this post to highlight just one of his dialogical principles. It seems to me that the pride that prevents us from saying “I was wrong” is what is driving at least some of the more extreme parts of our church and preventing them from talking and listening to one another. Thus, as bishop Josiah himself put it, some African bishops don’t want to listen, they want to dictate while some of the Northern bishops want perpetual “dialogue” (scare quotes on purpose) for the sake of avoiding a conclusion. Because a conclusion means someone is going to have to say at some point, I was wrong. So it is that the most vocal in our current disagreements (you might think its about sexuality, but it’s not. Sexuality is the symptom. Revelation, Scripture and Interpretation, and finally, holiness are the issues) remain vocal precisely because they are afraid to risk being quiet long enough. For them, the call to listen means, “listen to me.” When Rowan and Josiah (and Jesus?) call us to listen, however, they mean first, listen to the Gospel and then, listen to the other with such a degree of care and humility that the possibility of conversion is real. This, of course, is not easy. The extremes want to grasp the nettle of our disagreement but only half-way. They will live with the pain that comes from compelling the silence of the other. And the result is that a pseudo dialogue that fosters first mistrust, which eventually gives way to suspicion and finally to hatred. But the Gospel (and Rowan and Josiah), it seems to me, calls us not to grasp it half way, but all the way. To grasp it, if I may put it this way, until we bleed. To live with the pain that comes from a willingness to risk the three little words, “I was wrong.” And not just that risk–though that is great enough–but also the risk of mistreatment of those with whom we agree who think that we have in taking this risk let the side down. This happened specifically to Bishop Josiah when two Christian pastors in Nigeria confessed to plotting his assassination for “going soft” on Islam. Imagine! Neither of them were Anglicans! But the rhetoric has been pretty heavy from within our church, too. And I cannot help but be impressed with the grace and joy and even humour with which he lives with it. Because, as he puts it, there is no alternative. In Nigeria, it is either dialogue with Muslims or bloodshed. And of course, it has also happened to Archbishop Rowan who has been assailed from both sides in our intra-Commuion debate, but especially from the more liberal camp from which he hails, for failing if not to compel agreement, then for failing to use his authority in a more coercive way than he has done. This sounds pretty ranty. I don’t mean it to–though I do feel passionately about it. And I am very well aware that there are readers of this blog who will not be at all pleased with what I have written for they will take it as a judgment on them. Please know that from my end, it simply isn’t. It is more of a “hie stehe ich” moment for me. Bishop Josiah’s presentation today helped clarify in my mind just why I am where I am, why I believe what I do, and why I am willing to risk friendship and table fellowship with people whose positions are very different–even and perhaps especially in my own parish. We have, I hope, grasped the nettle of our disagreement together that our suffering may, in Paul’s language, complete the sufferings of Christ (Col. 1:24). There really is, as far as I can see, no alternative. This has been a year for funerals. As I come up to my first anniversary as Incumbent at Church of the Epiphany, I have conducted 14. Ten of these have taken place in the chapel at the funeral home just a couple of blocks down the street; four have been for well-known parish members. My Archdeacon tells me that this is an unusually heavy year in terms of numbers. I can’t say. But the experience has been formative and important for me in my parish work here. First, it’s helped me reflect on the place and importance of the funeral. The funeral, in the Anglican tradition anyway, is the way in which we bring this most abnormal and shattering of events—death—into the life of the community of faith. The way in which we normalize it, normalize our grief, and set them both in the context of worship, of faith in the One who from whom we have our beginning and to whom we return at our end. The scriptures, songs, sermon and prayers are meant to comfort—both in the sense of softening and in the classical sense of strengthening—the bereaved and to give them hope for the resurrection and the day when their tears will be forever wiped away. What a powerful and important place to sit as a minister of the Gospel! It has become—and I hope will always remain—a privilege to sit with families in their grief and to offer what resources are mine to offer as they walk through the Valley of the Shadow of Death. Second, it’s allowed me to see just how odd a Christian funeral really is, or at least should be. In the Anglican liturgy, apart from “brief words” about the deceased at the beginning of the funeral, this is a worship service. It is about the God who remains present with us even in this most dark of times, a time when for many, God will be remote if not utterly absent. So we surround ourselves in the funeral with the signs of his presence—his Word, his Sacraments, the praises of his people which we believe he inhabits. In our culture, the funeral is more often than not about the deceased, their life, their contributions, the grief their loss brings. There’s nothing wrong with any of these things of course, but increasingly, there is no attempt to set those things in the larger context of the community and within the larger question of the community’s covenantal relationship with God. And that cultural disconnect leads to what for me is the hard part. In the 10 funeral chapel funerals, I have been asked as an Anglican minister to offer an Anglican funeral for the sake of folks whose connection to any community of faith is tenuous at best. (This is no judgment on them, of course. And it is quite significant—especially for those who revel a little too quickly in the notion of “post-Christendom”—that even the most de- or un-churched of folks turn to the old and battered institution in hope of a little comfort. Their intuition is good. It is an opportunity for grace and for the Spirit to continue, or perhaps even begin, his mysterious work in those lives. ) Even as I honor the instinct, and welcome the opportunity to bring the Gospel to this situation, however, I have begun to wonder just what comfort and hope the Christian funeral can give to these folks. For if the funeral is to function as I described above—and it does do that!—it assumes a long relationship with the church to whom the rite belongs. It takes for granted a familiarity with Holy Scripture, with the promises taken in our baptisms, with the hope infused in every Holy Communion and through that familiarity, brings the foreignness of death within its bounds. So it is that in every funeral, we embrace the hope that Christ is Lord of both the dead and the living even as, in our grief, we acknowledge that the dead are, well, dead. But what of my congregations at the funeral home, who have called on me because someone at some point perhaps decades past was connected to my parish? While I dare not dismiss the work of the Holy Spirit in and through the Word read and proclaimed, I can’t help but feel that the words don’t do what the framers of the prayer books hoped they would. I fear sometimes that they have precisely the opposite effect—they take the foreignness that surrounds death and make it even more foreign. I am certainly going to keep officiating at these sorts of funerals because I really do believe that even if the liturgy no longer functions as it should, the Word is still the vehicle through whom the Spirit breathes, still the fit witness to Him who conquered death. But even as I do, I am going to feel like a stranger, a little less at home every time and wonder a little more if the liturgy can do what they’ve asked of it. Hey TF readers, beginning in July and following thereafter for a good long while, I will be preaching from the OT lections. For a number of reasons. (1) I need to bring this literature more securely within my preaching orbit. (2) I believe in the continuity of the covenants. (3) I see a creeping Marcionism that is embarrassed by the earthiness and violence of the OT amongst lay people and clergy that I know. So, I’m looking for commentary recommendations. Today, it’s the best preaching commentary you can recommend for Samuel/Kings. Click on the title of this blog and you’ll be able to add your recommendation in the comments section.